Home Recipes	Homemade Pasta with Semolina Flour! Happy Wednesday, friends! I hope you are having a wonderful week. Today I want to share our new favorite dish. (And a fun new family tradition!) How to make Homemade pasta with semolina flour! This past Christmas was one of my very favorite on the books! Not only was it our first Christmas back in our beloved North Carolina, but our three children came to spend nearly a week with us! Our two sons and daughter-in-law came in on Christmas Eve-eve. My husband and I wanted to do something extra special for dinner the night they arrived. We are all foodies and love to cook. And, we all love great red wine! So, we decided to surprise the kids and make our own homemade pasta, meatballs and Bolognese. As soon as they arrived and unpacked, we passed out aprons and set to work! My husband, Brad, because he is the main cook at our house, also wore a chefs hat and his favorite “Bam! !” apron. After donning the appropriate cooking attire and gathering our ingredients we began by making our pasta. 1-Homemade pasta can be mixed by hand or a stand mixer. 2-If making dough by hand, mix all ingredients to make a stiff dough. Knead by hand about 10 minutes. (We mixed our dough by hand, the old fashioned way.) Here is my husband and our beautiful daughter-in-law, Brie, making the dough. 3-If using a mixer, use the dough hook and mix all ingredients on medium speed until well mixed. 4-If the dough is too sticky, sprinkle on additional Semolina flour until it comes together. If dough is too dry, sprinkle water until you get the right consistency. You knead the dough until it is elastic. Slice the dough with a paring knife. If you see lots of air bubbles, keep kneading. The dough is kneaded proper when it forms a smooth elastic ball with few air bubbles. This is our son, Nicholas, helping out by adding a bit more semolina flour to the dough. 5-Wrap the dough in plastic wrap or in a covered bowl and let rest for at least 30 minutes. This is a good time to start the meatballs and Bolognese sauce. All hands on deck. This process is best served with several sets of hands. Notice the flour all over the counter? It’s messy too, but oh so worth it! (Hence the aprons.) Here, Brad feeds the dough into the machine as Brie, cranks. Our older son, Chase (Brie’s husband) catches the dough as it comes out flattened from the pasta machine. Because we deemed this at least a “once in a lifetime making of pasta”, everyone took a turn cranking the pasta machine and made a set of noodles. I know for certain we will make this again. This is how the pasta looks after going through the pasta roller and cutter. 7-To cook, bring a large pot of heavily-salted water to a boil. Add pasta and cook approx. 3-5 minutes. 8-Drain pasta and serve immediately with your choice of sauces. 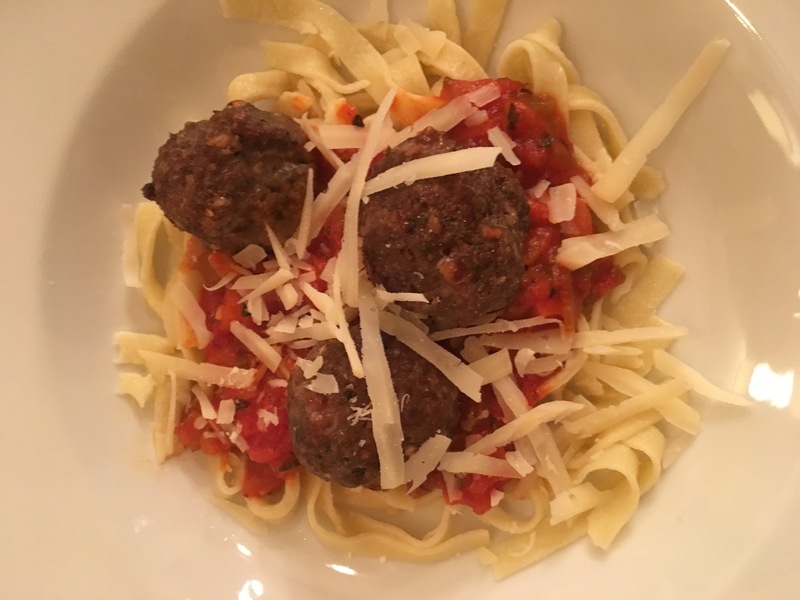 We served our fettuccine noodles with a fresh Bolognese sauce and homemade meatballs. I’ll share the meatball recipe soon. They are SO good, and if you are going to the trouble to make your own pasta, you may as well make your own meatballs, too! We topped it with freshly grated parmesan cheese. This was the most fun I’ve ever had cooking with my family! Everyone took turns kneading the dough and cranking out the strips of pasta. We can check this off of our bucket list, but I know for sure this will not the last time we make homemade pasta! And I can honestly say it was the best pasta I’ve ever had. The noodles were so soft and you could taste the fresh olive oil and ingredients. I think we may have stumbled upon a new family holiday tradition! The evening couldn’t have been more perfect. Anytime our precious children are with us, we feel complete. We had Christmas music playing throughout the house and the twinkle of the lights and decorations made it feel like a scene from a movie. (And a bit of delicious Cabernet Sauvignon helped!) Maybe next year we will try our own lasagna or ravioli! Move over turkey and dressing. You have new competition! Taco Bean Soup-A simple & yummy chili!